There's a little book titled "Like Grains of Wheat" that jumped off the shelf into my hands this morning. Written by Margaret Swedish and Lee Miller in 1989, it chronicles the lives of martyrs in the struggle for human rights in Central America. 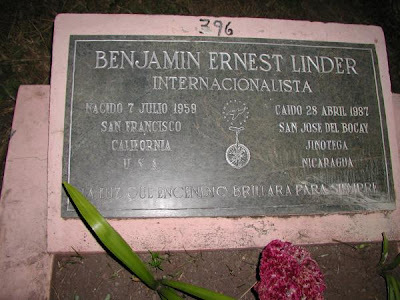 Benjamin Linder is one of the martyrs remembered in its pages. When I saw his story, I remembered Linder's name. Having been to Nicaragua twice with Witness for Peace, and having witnessed up close the death and destruction visited on the innocent by the U.S. supported contras, names of martyrs made an impression on me. But as I read the material, I soon realized I had forgotten his story. It bears repeating. Benjamin graduated from the University of Washington in Seattle in 1983 with a degree in mechanical engineering. 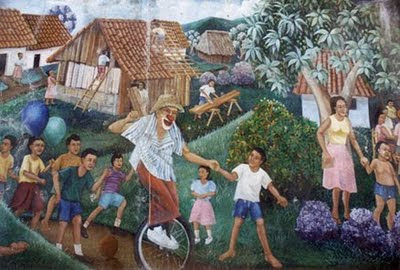 Because of his concern and work for peace, especially in Central America, he felt he had limited work options. He didn't want to work for corporate defense contractors but preferred using his skills in making a positive social contribution. In late 1983, this conviction led him to begin work with the Nicaraguan Energy Institute, helping build small scale hydroelectric projects to bring electricity to isolated rural communities. He lived with the people of El Cua. Theirs was the first village electrified by his projects. The villagers celebrated all night the first time the lights went on. Linder also helped people celebrate in other ways. He was an accomplished clown, juggled and rode a unicycle. He taught the children all these skills. On April 28, 1987, Ben and other workers were ambushed by contras as they were working on a project. Ben was wounded by shrapnel from a grenade and then shot in the head at close range. Two Nicaraguan project workers, Pablo Rosales and Sergio Fernandez, were killed as well. Since Ben had expressed a wish to be buried in Nicaragua, he was. The thousands who walked in his funeral procession included several clowns and jugglers. The title of this little book of remembrances, "Grains of Wheat," comes from the Gospel of John, 12:24. "... unless a grain of wheat falls on the ground and dies, it remains only a single grain; but if it dies, it yields a rich harvest."